We had a great group of teens from the Appalachia Summer Regional Governor’s School visit the farm today with their instructor Penny Moseley. They are studying economic development with the arts and learning more about some of the work and members of Round the Mountain. We gave them a tour of the farm and were able to share a little about our business. 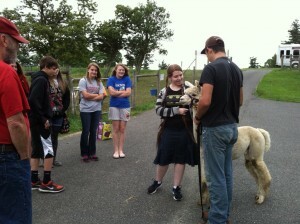 We love to give farm tours, and have had quite a few tour groups come through this summer already. Our tours are designed for all ages, and we try to adapt them to each group’s interests and needs. We generally bring out one of our alpacas so everyone can pet them and see an alpaca up close as we talk about these fabulous animals. Then we talk about the process of moving from the alpacas to processing their fiber into beautiful clothing and other items. As much as possible we let people touch the fiber in each step of the process as we discuss them, usually demonstrating spinning and weaving. A quick tour through the store to see the many things that can be made with alpaca concludes the tour. If you have a group that would enjoy touring the farm, give us a call to set up a time. There is no charge for the tour, as we love to share our beautiful and fascinating alpacas with others. 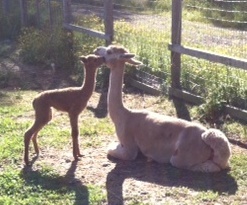 Today marked the birth of the last alpaca cria for our spring season, and the first cria for our sweet June Delight. June gave birth to a lovely female cria June 23, at about a quarter to 2 in the afternoon. Peaceful Heart’s Summer Love is as beautiful as her mother, and has a hint of gray on her feet from her fabulous rosegray herdsire, FWD Kubla Khan. Summer Love will be a great addition to our herd. She weighed 17.2 pounds and was quick to roll over and work her way up onto her feet. The other crias in our younger alpaca pasture were quite interested to see what was going on, and actually rushed over to meet Summer Love before June Delight had quite figured out what was going on. June spent the first few minutes after Summer hit the ground, watching her out of the corner of her eye. It didn’t take June too long to realize that Summer was hers, though, and show her true colors as an excellent mom. She is staying close to Summer, humming to her, licking her face, and standing perfectly still as Summer masters the art of nursing. 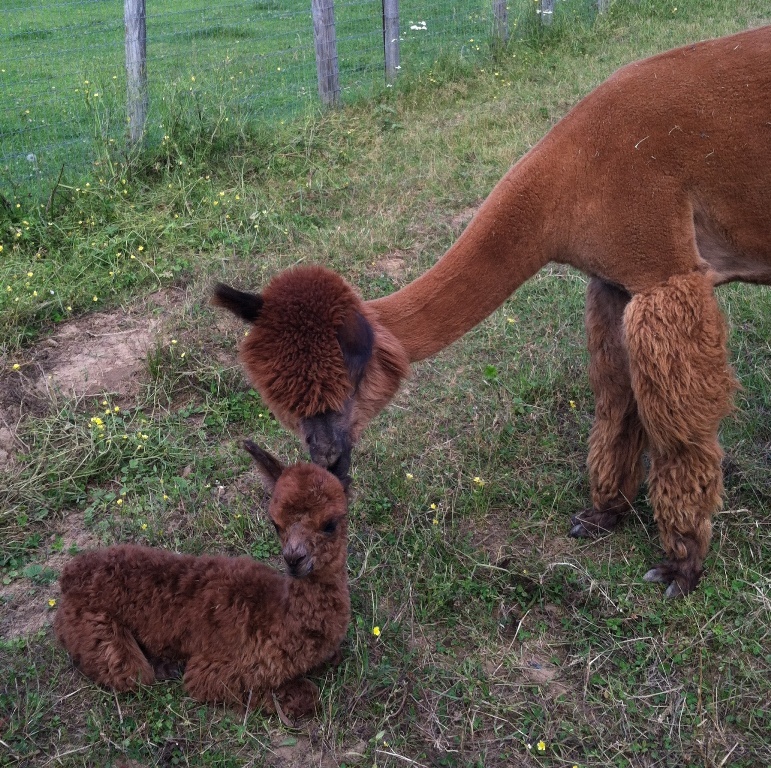 Alpaca crias nurse for just a few minutes every 30-60 minutes when they are first born. They never nurse for too long at one time, but the frequency gets further between nursing sessions as they get older. 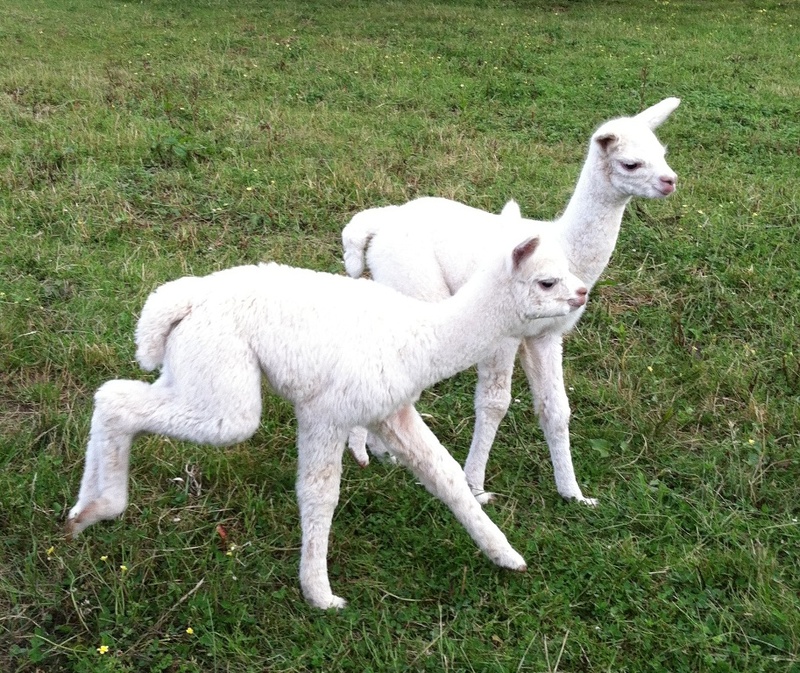 We are through with alpaca births for the spring, and thoroughly pleased with this year’s group of crias. 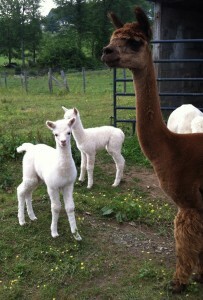 We have had 6 alpacas born to our farm; 4 girls and 2 boys, the oldest born almost a month ago. (And 1 handsome boy that will be moving with his mom to his new farm by fall.) You can read all about each of them here in our website posts and see more pictures of them and life on the farm at our Facebook page. We also invite you to come by the farm and see them all in person. We were thrilled to welcome a very big boy to our farm on June 18. Peaceful Heart Tennyson’s Ulysses was born to Peruvian Natasha and Lord Tennyson, weighing in at 24.4 pounds. 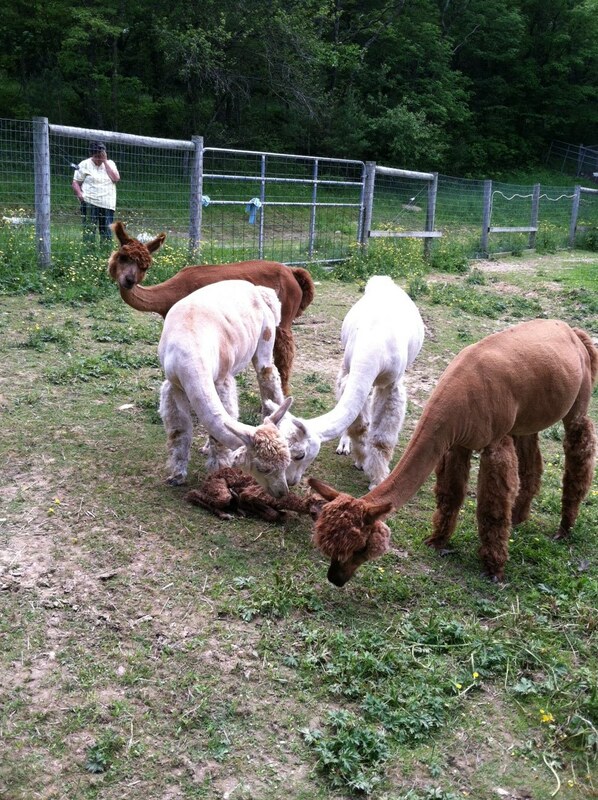 Alpaca crias generally weigh between 14 to 18 pounds, so Ulysses hit the ground with quite a bit of a head start. He is bigger than his older half sister Wild Bells (born 6/13/13), and is having a great time playing with her. Ulysses not only has the size and presence that reminds us of his sire Lord Tennyson when he was born, but also has the incredibly dense fleece. We expect Ulysses to be as impressive a herdsire and do as well in shows as his sire (you can see a list of Tennyson’s winnings on his herdsire page). Ulysses carries the genetics of Bueno and Caligula from Tennyson’s side as well as Hemingway, Snowmass Black Diamond, Guellermo and Timoteo on his dam Natasha’s side. Unfortunately, we will not be able to put Ulysses to work on our farm because he is so closely related to many of our alpacas. Natasha and Ulysses are available for sale, and present a great opportunity for someone to add this super future herdsire to their herd. We are happy to announce the birth of a beautiful male alpaca cria. Peaceful Heart’s Ninja was born on Saturday to our sweet Sugar Cookie and the impressive Kubla Khan. He is a gorgeous true black. 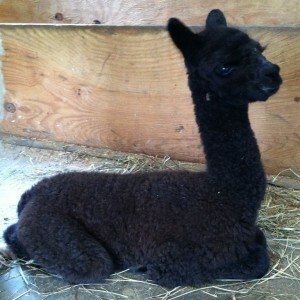 We are expecting Ninja to grow into an impressive herdsire. 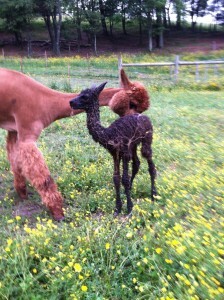 People often ask us about the color of our alpaca crias. A common question is if they will stay the color they are at birth; they do. 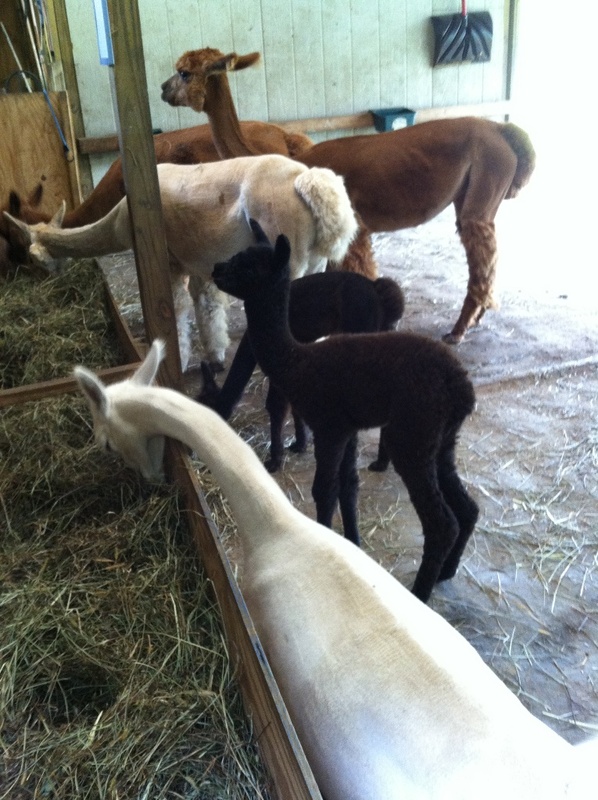 You may see a little color variation from when they are first born, because the fleece they are born with (their ‘cria tips’) is often a slightly different color due to a reaction with the amniotic fluid, but the color at the roots is the color they will be. We shear our spring crias at one to two weeks of age to remove these cria tips. We like to wait that long, if the weather permits, because it allows all the amniotic fluid affected fleece to grow out long enough to be sheared off and give us a nice consistent start to their first year fleece. If the crias are born later than we plan or the weather turns particularly hot, we will shear crias as early as 1-2 days after birth. Another common question is do we know what color they will be before they are born? No. We usually have a good guess, but we have been surprised many times. 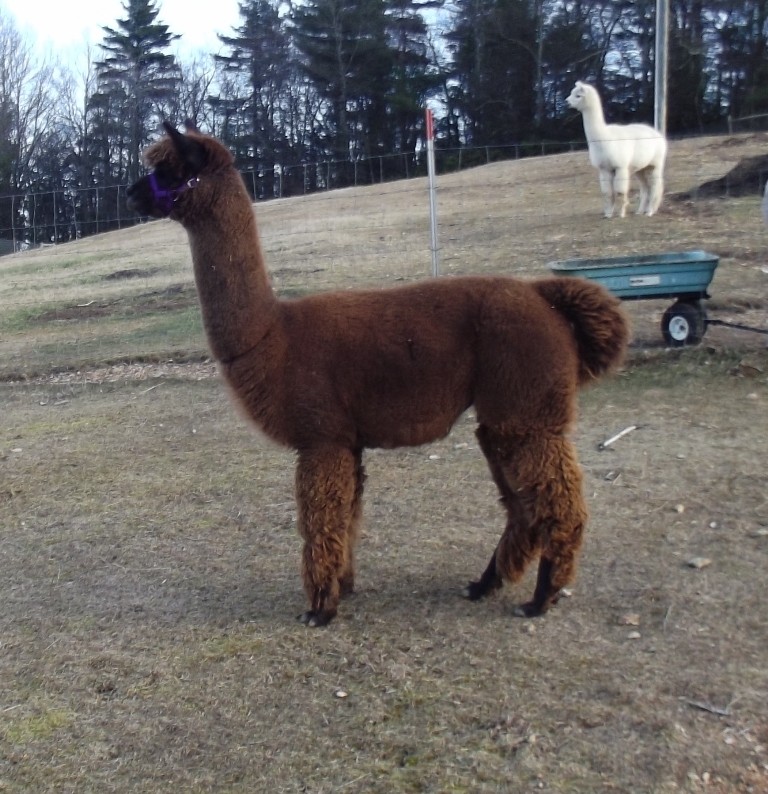 Ninja and his half sister Earlyne both surprised us this year being much darker than we expected from the combination of their mothers and their dark rosegray sire, Kubla Khan. Ninja’s dam is our lovely pale fawn Sugar Cookie. Sugar is a daughter of our fabulous Powergrid, and has given us two beautiful white boys previously from white Lord Tennyson. We assumed we would probably get a fawn or brown cria from the combination with Kubla Khan, but are thrilled with the color of Ninja, and are particularly pleased with the crimp and density we are seeing in Ninja’s fleece at this early age. Ninja’s sire, FWD Kubla Khan is a son of the famously dense, 11 time Champion and 5 time Get of Sire winner, The Aga Khan. He is descended from Shere Khan, possibly the most famous herdsire in Peru, who sired the Vendagor/Capac line. Kubla is a stunning Champion with a strong background of color on his maternal side. We invite you to come visit Ninja and the other spring crias. 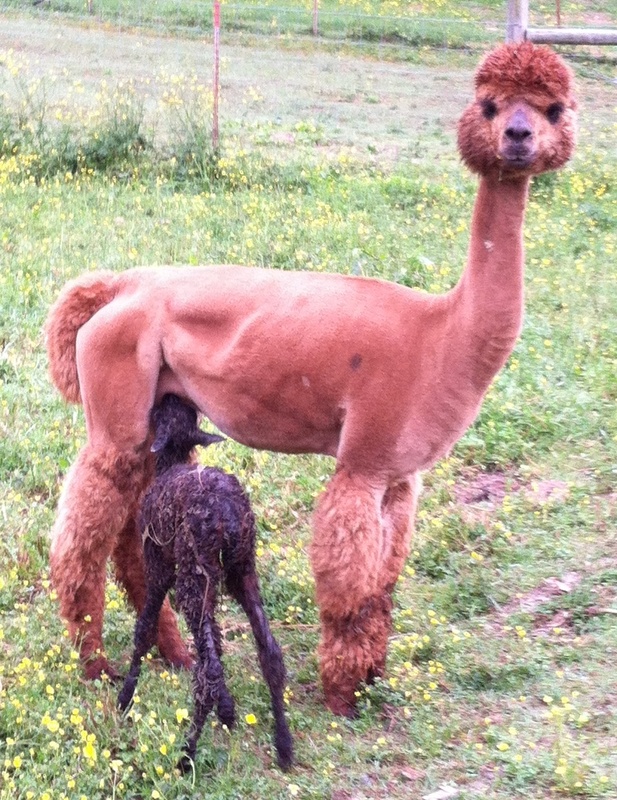 We are happy to announce the birth of our third female cria this year, Peaceful Heart Tennysons Wild Bells. 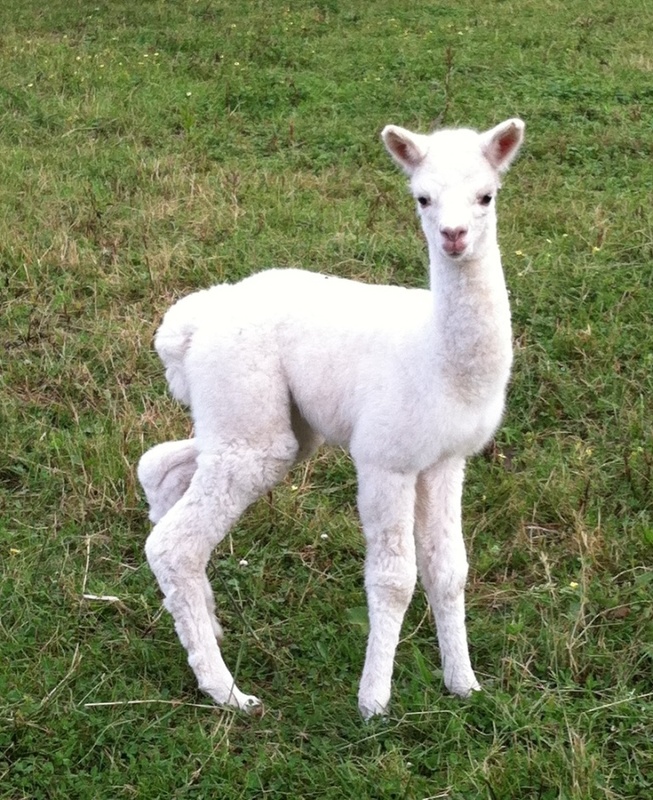 Bell is an adorable white alpaca who, like Early Riser, was born way too early in the morning for an alpaca. We went out at 7:30am to find her walking around the pasture, nursing, and already dry. We’re wondering if the weather this year is affecting the girls’ birthing schedules, as we’re not the only farm in the area with early morning births. Bell’s mother is Snobelle, who is a recent addition to our farm. We bought Snobelle last year, and this is our first cria with her, though she has had others before moving here. 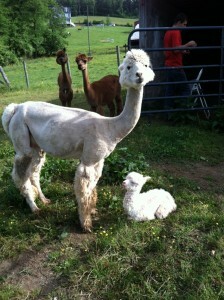 Snobelle is a white alpaca with incredibly fine fiber. 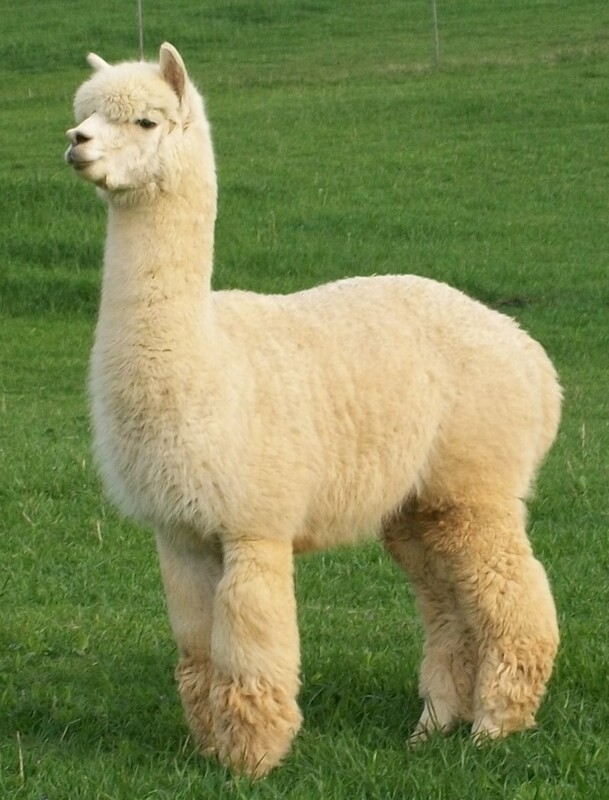 At 7 years of age, her fiber is still classified as royal baby alpaca fiber (19 microns). Bell’s sire is our own Peaceful Heart’s Lord Tennyson. Tennyson has beautiful, dense and crimpy fiber, and has been producing lovely offspring. 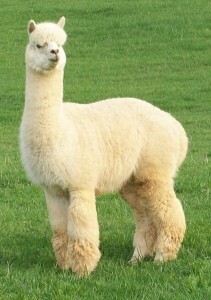 In March, he won Get of Sire at the Virginia Classic Alpaca Show based on the entry of three of Bell’s fabulous siblings. We are still awaiting a few more crias this spring. You can see pictures of our earlier crias’ first haircuts on our Facebook page. They were all quite happy to get that extra fiber off and be cooler for summer. They sheared between 4-7 ounces each. For those visiting the farm, we’ll have samples of our girls’ fleeces available in the store. We are pleased to announce the birth of Peaceful Heart’s Early Riser on Wednesday, June 5, 2013. “Earlyne” is a lovely bay black color, and a very active girl. She was born to our beautiful Bonnie Alice and the impressive Kubla Khan (rosegray son of The Aga Khan). Both are known for their dense fleece and heavy shear weights, and we are expecting the same from Earlyne. Early Riser earned her name by surprising us Wednesday morning when we looked out the window and saw her walking around the pasture at around 8am. Alpacas generally give birth between 9 in the morning and 2 in the afternoon, and it is rare to have a birth earlier in the day. In the approximately 50 births we’ve had on the farm, we’ve only had one other very early birth. Apparently, being off schedule did not affect Earlyne at all, as she was already running around the pasture and nursing when we first saw her. 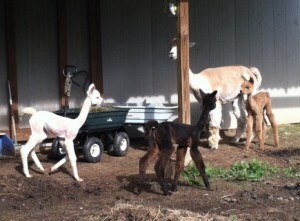 Our rainy weather has interfered with Earlyne’s frolicking a bit, since we have moved her and mom Bonnie in the barn. Unfortunately, sometimes alpaca crias don’t have enough sense to come in out of the rain, and we (and Bonnie) were getting tired of trying to keep her under shelter during the downpours. Luckily, dryer weather is on the way and she will soon be free to get out and play with Ziva and William (who do know enough to get out of the rain). Congratulations to Kathi and Mark of MacKenzie’s Meadow Alpaca Farm on the birth of their newest farm member, William Wallace. William Wallace and his dam Sunrise Surprise, “Sunny”, will be living on our farm for a little bit longer as their new home is being prepared. William is enjoying running around the pasture with his new buddy Ziva David. You can see them both when you visit the farm. They are living with their moms in the pasture near the barn. 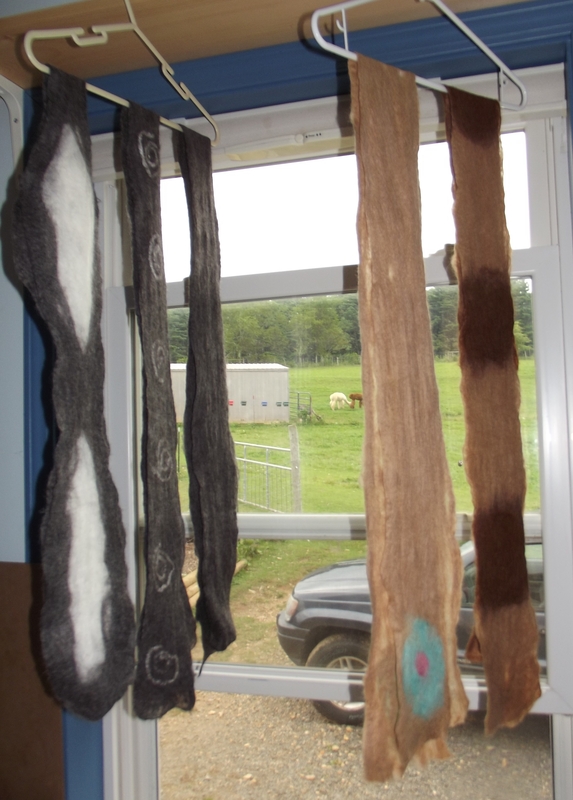 We have scheduled three new Fiber Art Classes at Peaceful Heart Alpacas for this summer. Join us on August 17, 2013 as we create two beautiful, 100% alpaca scarves. Using a technique that combines machine and hand felting, we will use baby and superfine rovings to design and make one of a kind scarves in natural colors. 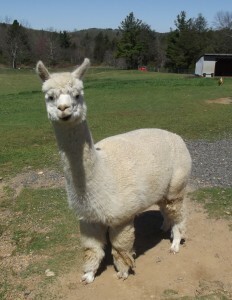 We will meet from 1-5pm, Saturday, August 17 in our fiber art studio, surrounded by pastures of beautiful alpacas. The class will cost $40 plus a $20 materials fee. We hope you can join us for this fun class designed specifically for alpaca farmers and alpaca lovers. On June 15, join us from 9-11am to learn the two basic stitches on which all knitting projects are based. We will learn to cast on and off, knit and purl. As we practice our stitches we will knit a swatch and then begin a scarf. Class members are welcome to stay and continue knitting after the class in case they have additional questions. From 2-4pm, on June 15, we will offer a beginning crochet class. We will learn to begin with a chain stitch and then learn three basic stitches, a single crochet, double crochet and filet stitch to begin an easy alpaca scarf. Class members are welcome to stay and continue crocheting after the class in case they have additional questions. Class sizes are limited and preregistration with a $25 deposit is required. You can register by phone or online.